This 20 minute vinyasa practice is designed to help you build strength and endurance – mindfully. Yoga Tone invites strong breath to help tone the body! Invite your mind and body to start working for you instead of against you. Get strong with regular practice and comfortable in your beautiful body. Stay present. Let’s move! I have been practicing with your yoga videos for less than a year, but I already feel the differences in my days as a result of this practice; sometimes they are subtle little reminders/helpers, and sometimes they are big game changers. Here was a big one for me: I finished a nerve racking procedure at the clinic which would normally have left me in anxiety and tears. But I used a few of the breathing and hand placement techniques I learned from your yoga classes throughout the appointment, and because of this I finished it tear free and even felt somewhat comfortable. Thank you for your support and guidance. thanks Adriene you are the only teacher who gives me the strenght to do yoga every single day. I have done the same thing though started in February 2015 and feel the same way! Namaste. I didn’t know where to contact you so I’ll just leave a message here on your blog. My name is Ida, I’m 22 years old, live in Norway and have subscribed to your YouTube channel. I first started loving yoga through your classes, so thank you! Now I have a challenge for you: Almost 2 weeks ago I jumped and fell on the ice, and broke my left ankle in three places in the process. Today is the day they’re finally letting me out of the hospital, and I’m eager to start working out again to speed up the healing process. But: There are a lot of exercises I can’t do. I can put weight on my knees and parts of the left leg, just not the ankle. Could you make a video or two with yoga that I, and people who can’t use an arm or a foot, can do? There are a lot of them out there, so these videos won’t benefit me alone. I realize that it is a big challenge, but I think you’re up for it. Thank you in advance, I look forward to doing yoga with you again – with only one leg this time! Copy that! Thank you my dear. In the meantime explore the Dorm Room Yoga video as well as the silent series, as well as the office yoga. Thank you, Adriene. I hope your ankle heals quickly Ida! Adriene, I am never disappointed. Thank you! Just wanted to say thank you for making me feel normal again. Sending love and big time gratitude your way. Adriene, your videos have changed my life. I connect with you as a teacher and I look forward to coming home and finding the perfect YWA video to fit my mood/ability that day. This may sound a little silly, but I also want to thank you for dressing appropriately in your videos. I’ve watched way too many videos from yoga teachers who dress in skimpy clothing and I have a hard time trusting their intentions. I appreciate you! THANK YOU! You are a great inspiration and an example of constancy i really like. I admire you a lot. I’m writing to describe my problem: following Yoga Camp after only three days I had to stop because of my problems to the cervical spine. I am 49 years old, and my work of designer / illustrator often requires me to keep his head down on the drawings. This causes me contractures, neck pains and headaches. Unfortunately my cervical spine has become straight and then curved in the opposite direction to the physiological one. I need to know what I CAN do or CANNOT do at all practicing yoga with you. I am very worried and frustrated because I do want to practice yoga by following your wonderful videos, but I’m afraid to seriously hurt my neck and worsen my cervical vertebrae situation. Also dizziness bother me especially when i stretch neck and shoulders muscles with some poses. A few time ago my osteopath has told me to practice yoga. In you i have found an amazing teacher. Another great video! Thank you for addressing the fear factor we may feel when an instructor announces, “Okay, now we’re going to do boat pose….” Boat has always been a tough one for me and I get a little fearful. Your cue, “Don’t be afraid,” was perfectly timed and it helped me stay with it. Simple, but effective! Hi Adriene: I did you Yoga Camp and loved it!! So now I revisit Yoga Camp but also am doing Yoga Tone… great great videos. Your voice is very relaxing and you challenge, but encourage. Keep it coming!! I’m Valeria from Sardinia and I have to say that I really like your style and sense of humour. I feel that I’m not alone doing your yoga asanas and I’m never bored to have a yoga session with you! thank you very much! Adriene you have the ability to bring enjoyment and light heartedness to the yoga practice. Please continue to contribute such brilliant videos to the community. I love you. I love yoga. I feel like you are right here with me everyday practicing one of your fabulous videos. I am enough. I embrace the Now. I release all things that are blocking me from the sunlight of the spirit. I love and accept myself exactly as I am. I’ve been practicing with you for a few years now and never get bored. In fact I look forward to your silliness. Adrienne, I have always lived a fairly active lifestyle. In the last couple of years my son has had some mental health issues dealing with anxiety and depression and my hockey, cardio, cycling and running has been put on hold. It is VERY difficult at times. About 5 months ago I started following your yoga videos to decompress from the stresses of helping my son with his challenges. I continue to encourage him to join me because I know that the breathing and movement techniques practiced in yoga have been proven to help people with mental illness. He has yet to do so but I have benefitted greatly from the calming practice and your laid back approach. And have actually started spinning in my garage and taking bits of time here and there to get ME back. Thank-you! Hopefully soon my son will benefit too. I wanted to personally thank you for saving me. I have done yoga on and off over the years, but following recent unemployment, a bad break up, depression and social anxiety, I haven’t been able to go to classes. Your videos have got me through this difficult time. 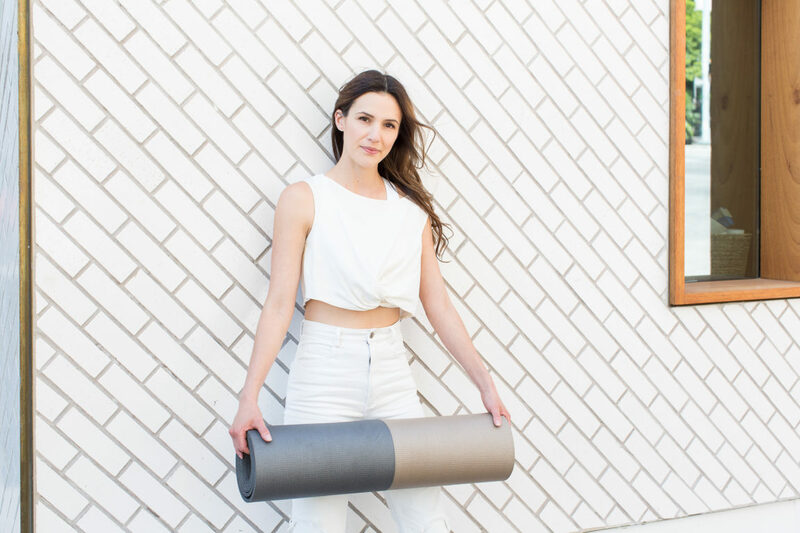 Every day you remind me that I am in control of my own happiness; that I can connect to my body and spirit; that I deserve love and respect – especially from myself – and you have given me a reason to get up and on to the mat every day. I love your kind, slow and positive approach to practice and to life. Your mantras for the yoga camp have, each day, been so relevant to my mood that I have found hope in that synchronicity. Thanks and gratitude from fhe bottom of my heart. That was an awesome practice! Perfect for strength and relaxing the body after work! I love it! I have taken yoga classes on and off for years…(maybe 15?) and I always loved to love yoga…wanted to love it but I never really connected with it till I found you! Your videos have made me love love love yoga and I have reached that place where I cant wait it feels so good! That was in December and then I found 30 days of yoga then yoga camp and now I just look on your site and find gem after gem, I love it! Thank you Thank you Thank you! Mucho Gracias and Merci Bocou and all that. I love the way you teach yoga and also your sense of humor. Also I want to thank you for the yoga mat spray idea, I use it for room freshener too. I love essential oils, that was a no brainer really but I never thought of it. Thanks! Finally after many years of starting and giving up yoga due to never feeling like I was “doing it right”, I found you. You are the first teacher that really speaks to me, helps me to feel connected to the practice in a meaningful way. Each day I look forward to getting up to do yoga with you and before I go to bed. I love your sense of humor, permission to do what feels right, not just what looks right. If I am ever back in Austin (where I grew up in the Summers!) I hope to make it to one of your classes. You are a naturally gifted teacher and such a calm, positive presence. Keep up your amazing work and touching the lives of so many. I have told anyone who will listen about you and about my new found love for yoga! Also, thank you for incorporating a mindfulness component in your work, permission to rest not just the body but the mind. I also meant to mention that all 5 of my children gather around to do yoga with Adriene with me. While I think your videos are wonderfully appropriate, I would LOVE to see you do a few videos specifically for children. I’m Ireland we say draw the curtains & we mean pull the curtains in case your getting a mental picture of me sitting there with colouring pencils looking at the curtains! I love this quick pick me up! Forces me to concentrate on my breathing and focus on how my body feels at that time. Thanks Adrienne! Namaste. I would just like to say thank you so much for your videos! I love them! Yoga was becoming a bit of a chore for me but your approach is so warm and welcoming and makes it so much fun. I’m amazed I can feel so supported by watching a video, perhaps more so than I have in some live yoga classes. The mindfulness you bring to the practice takes the pressure off and really helps me tune in to my body. So thank you again, I think you are doing something very special! Wonderful practise, and it really welcomed me back to yoga thank you for all your videos! I am enjoy the yoga video very much. Thanks for helping me. But, I have something to ask you, why when I’m doing yoga (weight loss), the sweat falls just from my head and neck? Am I doing the yoga not properly? He adriene!! I love love love you video’s you are so funny and i love how you make your video’s! It really helps me alot!!! Please never stop making new ones! Thankyou so much for being you and creating this wonderful world of Yoga for us. You literally saved my life with the 30 Day Yoga Challenge and I really feel the difference if I miss a couple days. I just don’t know what took me so long to try it out!!! Yoga Tone is one of my favorites! A big thank you for the free videos of yoga you provide. I have completed 30 days challenge and must say it really helped! Looking forward for more videos. Q: Why did the 3 legged dog go back to Dodge City? A: To find the man who shot his paw. So lucky a travelling friend pointed out this website to me! Tried this first practice and liked it a lot. Hi, i am really thin, i am trying to gain weight from last 2 year. is there any yoga with that i can gain weight? Not sure if your question has been answered in other places, but as an almost-pharmacist (one more year of school!) and someone who has experienced similar symptoms, I think I can help! It sounds like you have orthostatic hypotension, which is fancy talk for low blood pressure upon standing. This can be caused for a variety of reasons, mine was that I was eating too little and had very low blood pressure to begin with. Other causes can be medications, dehydration, and just having low blood pressure in general. I would suggest increasing the amount of water you drink and trying to stand slowly as to give your blood time to get all the way up to the head upon standing. If these aren’t enough to help, I would suggest talking with your doctor about your symptoms, as increasing salt can help (under doctor’s orders!) and there are certain medications that are beneficial. Hopefully this helps a little! Thank you Adrienne from a full time working mom with 2 children. I dont have much time for myself or to go do classes so this is perfect. You are an amazing yoga instructor. Thank you for your inspiration and reminder to love myself.